The foundation stone of the first Saffron Institute was laid down in Herat province at a time that the Afghan government plans to develop the culture of Saffron cultivation in other provinces. According to the authorities of the MoAIL the role of this institute will be extraordinary in development, research, marketing and full standardization of nourishing, harvesting and processing of Saffron and contributes in implementation of five years plan of saffron development. In their conversations with The Kabul Times reporter, economists said that in Afghanistan economic policy, saffron is a key product in agriculture that could cause creation of employment and sustainable economy. So far, many measures and planning have taken place by the government on improvement of its different aspects. Economist Sher Ali Tazri said, establishment of this institute could be as a joint cultural house among representatives of saffron producers and paves the way for development of this industry. This institute paves the way for export of Afghan saffron products into global markets. According to government authorities, formation of saffron committee is indicator of importance of this product for Afghanistan. As per the government planning, in 1395, over 240 tonnes saffron onions were distributed for peasants of 31 provinces as a result in 1396 about 6.10 tonnes saffron were produced comparing 1394.Saffron production was increased by 71pc in 1395. In 1395 saffron was planted in 2811 hectar land, in 1396 in 5200 hectar and saffron production ceiling is expected to increase in 12 years to 70-100 tonnes per year. Addressing the foundation stone ceremony of the saffron Institute, MoAIL Nasir Ahmad Duranay said, this institute would be constructed at a cost of Afs 58.8 million until the end of 1398. He announced that this would be the first equipped body in Afghanistan that would be operating for scientific and standard assessment for development, research, policy making and marketing of saffron products. Duranay added, prior to this the rate of saffron products was 12 tonnes in Herat but now as a result of our house to house survey, in 1397 over 15 tonnes saffron were harvested there. Talking at the same ceremony, acting and deputy provincial governor of Herat Muhayyudin Noori said in current year the product of saffron increased by 100pc because in 1396 it was 7 tonnes but in 1397 it increased to 15 tonnes. Currently saffron fields cover an area of 30000 acre lands. Minister Duranay called considerable growth of saffron as a glad tiding for bright economic future of Herat and Afghanistan. He said, good achievements have taken place in Turkey for selling of saffron and another big body is expected to be set up for saffron exports. Acting and deputy provincial governor of Herat Noori added, Turkey purchases Afghan saffron at international standards and exports it in the name of Afghanistan. 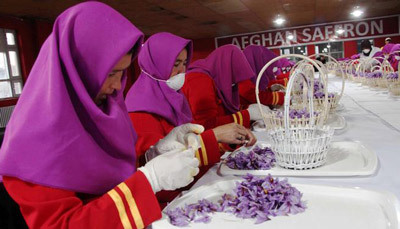 Confirming achievements in selling of Afghan saffron in Turkey, coordinator of Turkish aids to Afghanistan Dr Ali Chenar said, prior to this we had purchased saffron from Spain but hereafter due to its high quality and economic facility we purchase it from Afghanistan. Afghan Robatic Girls Team made a Robot for saffron collection that is indicator of Afghanistan efforts for development of this culture.